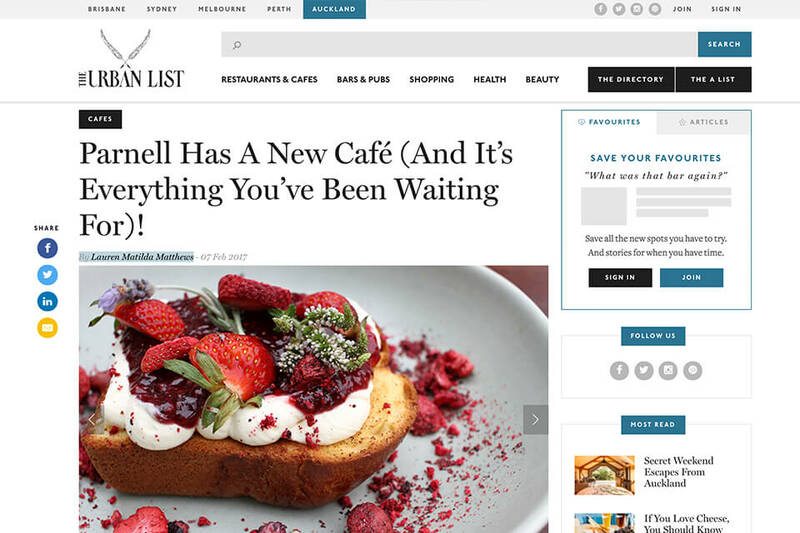 Parnell Has A New Café (And It’s Everything You’ve Been Waiting For)! Over the last wee while Parnell has had some life injected into it with a flurry of night-time eateries and bars opening up. What’s been lacking, however, is a good café to caffeinate and feed the locals so trust us when we say this new beauty fits that bill perfectly. Winona Forever is located in a prime corner position in the beautiful Geyser Building. Its lofty space includes a courtyard dotted with greenery, and a light and airy dining room decorated with eccentric furnishings, knick knacks and hanging plants. The first thing you’ll spot is the cabinet, which is heaving with glorious sweet and savoury treats. But if you can resist love at first sight and opt to order off their menu, you’re in for some epic eats. Jam on toast sounds rather boring, but here it’s reborn. A generous slab of brioche is piled high with whipped mascarpone and homemade seasonal jam, then topped with scatterings of fresh berries, making this dish as pretty as a picture. Mini ricotta doughnuts are paired with summer berries, chocolate pistachio and almond ice cream with dark chocolate soil and a raspberry, gin compote. And, if French toast is your thing, well then you’re going to be one happy diner—their take on the old classic is adorned with Eton Mess—piped meringues, mascarpone and berries. It’s no surprise that the savoury options are just as outstanding. Classics such as eggs bene are jazzed up and modernised in an exciting way. Perfectly poached eggs sit pretty on a turmeric, black pepper brioche and we can’t wait to try the ‘Lady Boy’—prawn benedict in a crispy noodle basket, chilli brioche, tom yum hollandaise and prawn crackers. The coffee is perfect, as is the service—owners Fran Mazza and Aaron Carson (formerly of Little Sister and Hello Friends & Allies) have absolutely nailed this. Winona Forever is exactly what Parnell and Auckland have been waiting for—let’s hope it’s around for…well, forever.